The Aniene valley and Villa Gregoriana in Tivoli is part of the Tentative list of Italy in order to qualify for inclusion in the World Heritage List. The "Villa" Gregoriana is actually not a villa, not even a building. Despite the naming and marketing, it is mainly the name for a hiking trail going through the valley of the river Aniene near the small town of Tivoli, which is better known for two other WHS sites, the more approriate named Villa Adriana and Villa D'Este. Although sometimes described as a park, the valley looks like a natural forest. There are some ancient remains, but they are so insignificant that they are barely worth mentioning. The river Aniene tumbles down the valley through various waterfalls, although most of the water is now redirected to avoid catastrophal floodings. The main claim to fame, however, is the connection with 18th century romanticism. The rugged stone formations, the waterfalls and the village high above it, complete with roman ruins, do indeed create a spectacular scenario. It takes around 90minutes to cross from one side of the valley to the other, and only a few more to get back to your start position. 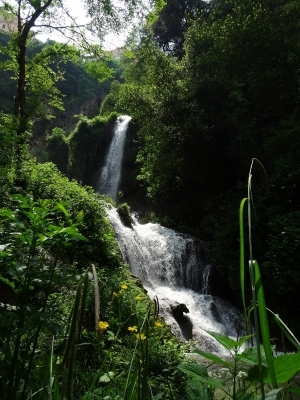 The nice walk will lead you to various vistas, waterfalls and grottos. All points of interest have fancy names, but not all detours really lead to something astonishing. The grotto of the sirens (or is it mermaids?) and of neptune are really worth it, the other sideways can be skipped if you want to conserve your energy. And that leads to the main problem with the site: It's just not in the same league as the other two WHS sites in town. Most people will go to Tivoli as a day trip from Rome, and if you try to cram all three "villas" into one day (I did), you will need a lot of stamina and will probably not be able to reproduce the dreamy enthusiasm of 18th century poets. What remains is a very nice, but strenuous hike with a bit of marketing cheese thrown in (like a hefty entrance fee). I do not really think that the Villa Gregoriana is important or unique enough to be a WHS, and the small town of Tivoli does not really need a third one. However, if you do have a bit of time and energy left, it is certainly a beautiful trail with a dash of nature, culture and 19th century engineering thrown in.